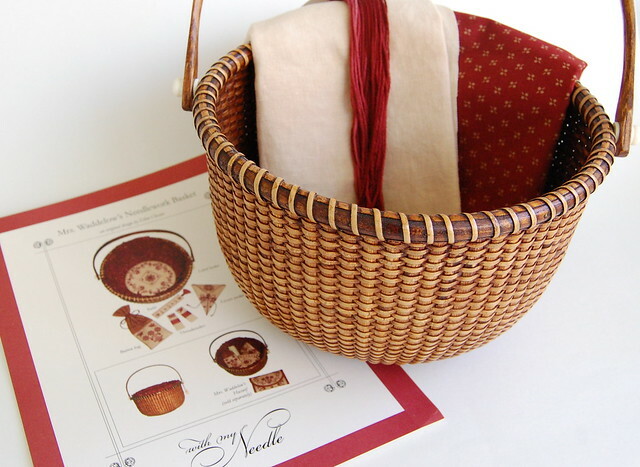 I got the basket for "Mrs. Waddelow's Needlework Basket" the other day. It's so pretty! I have been floundering between projects a lot lately. I haven't really been able to settle on any one thing. 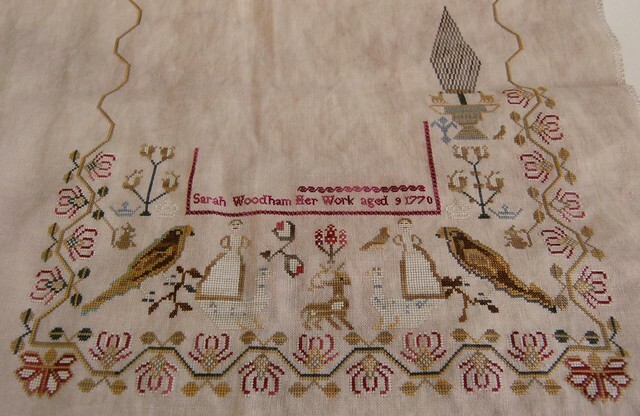 After seeing Siobhan's gorgeous progress on Sarah Woodham, I decided to get my sampler back out. I'm going to try to concentrate on it for awhile. 40 ct. Vintage Pearled Barley, various silk threads (1 over 2). Well, I think I'm going to take my son to the park this morning. It's such a beautiful day here in South Carolina. I might as well enjoy it as much as I can because it looks like we'll be staying here a little longer. My husband was trying to transfer down to Florida, but unfortunately it didn't go through. He'll try again the next time he's able (not sure when that will be). I'm trying to stay positive. I know things could be much worse. All I have to do is think of the people in Japan and realize how lucky I am. ETA: I had couple people ask where I got the basket. I got it through this website - http://www.nathantaylorbaskets.com/product/2232AA. It's the 9 1/2" basket. Sorry about your Florida plans Nicole! That can be so discouraging... YES...do go to the park! Enjoy the day! Take your stitching if you can. Love Sarah Woodham...it is so beautiful...and that basket!!! FABULOUS! Love your Sarah Woodham, and the colors are just beautiful. I have the same problem of floundering between projects. Love the basket - it's perfect!! Sorry about the move to Florida but I have to say, I'm glad you're not leaving any time soon. Hate to lose ya! Gorgeous basket! And I'm glad you got Sarah back out to work on. So sorry about the transfer. Hugs! Nicole, the basket is really pretty. I love it with the reds! Sarah is looking very pretty well. It's good to see you working on it again - such beautiful colors. I so want to stitch this. Such a pretty basket, it's going to be so lovely when it's all finished up. 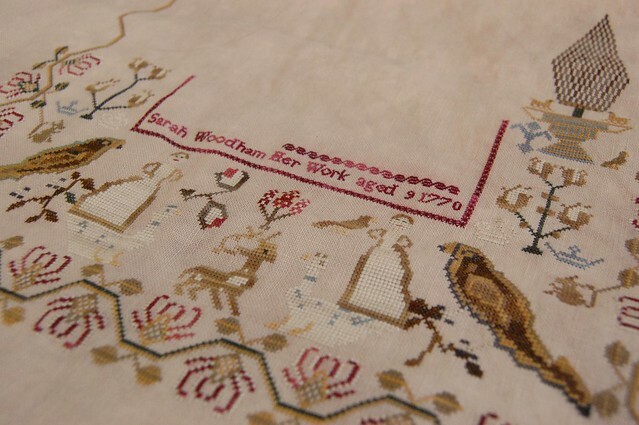 Love your Sarah Woodam progress...just gorgeous! Sorry about Florida...but you seem to have a good attitude about it. Sometimes when we don't get our heart's desire, I figure it's because God has other plans for us. I love the basket, Nicole !! And your progress on Sarah looks beautiful, I can't wait to see it finishes !! So sorry that your plans to transfer didn't work out this one time. Don't lose hope ! The basket is so pretty for the Mrs. Waddelow project. That Siobhan sure is a trouble maker... I've resisted Sarah W. for a long time, but I may just have to cave and order the chart. Perfect basket! So glad to see your Sarah Woodham out, I think she's so beautiful. I love seeing everyone's stitching on her. Sorry to hear you won't be coming back to FL this year, but hopefully things will work out for you to move soon. I love th basket.... can't wait to see all of the goodies stitched and finished! Sarah is gorgeous. This sampler gets very tedious. Sorry your plans didn't work out. Your work is beautiful. Enjoy!! One of my stitch group is stitching Mrs Waddelow's basket - stunning project and I know you will do it justice! I wish I could relocate to Florida too but I have to make do with a months visit in the fall! I love that basket!! And your Sarah Woodham progress, of course! ;) Thanks for the shout out! It is a lot of fun but I swear, I think I am going to see that border in my sleep!! Totally worth the wait. I keep seeing yours on my iPhone Flickr app, so it spurs me on. I can't wait to stitch the girls at the bottom. In my post I had a typo. It is not supposed to say things will work out the way you would like time to but should say I hope things work out as you would like them too. What a gorgeous basket! And Sarah look great. Love the basket and Sarah!!! I so sorry the transfer didn't come through. That's a great basket. The sampler is so pretty and love the colors. Sorry the transfer didn't work out this time. Hopefully, next time. I love your Nantucket basket - I have a small collection of them. Must resist the temptation to go out and buy another one.